Hello friends! 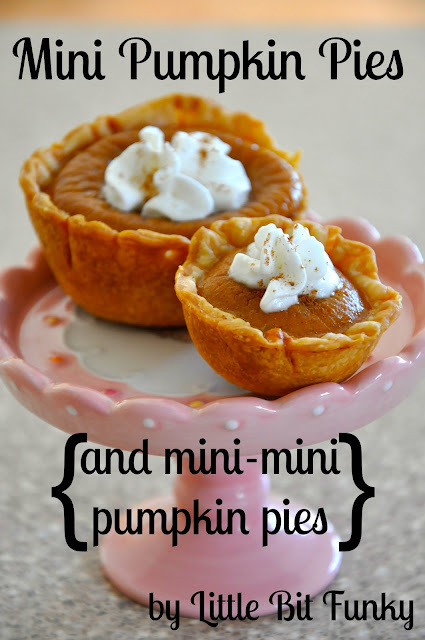 I hope you enjoy this mini pie recipe as much as you enjoyed my last one! This one is even easier than the mini-apple pies! Tis the season for all things pumpkin and I just couldn't hold out making something to suit the tiny feeling of fall in the air. Want to make some mini pumpkin pies and/or some mini-mini ones? Let's do it! Pillsbury makes me feel like I don't have to make pie crust from scratch, it's pretty good. You will also need a cookie cutter (or some sort of circle) that is about this much bigger than your muffin tin, both the regular and the mini one. You should also lightly spray your pans with cooking spray. Unroll your crust and cut out circles, lay the circle on top of the muffin hole and gently press down to the bottom. From there gently press the crusts to the sides, covering the whole muffin cup. Once I cut out as many circles as I can with the pre-rolled out dough, I combine it together and roll it out again and again. I made the edges look a little nicer by pressing the edges with a fork. This recipe will make 24 mini pies, 48 mini mini pies or 12 mini pies and 24 mini mini pies. 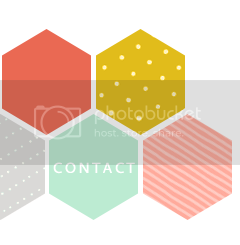 So cut out circles according to what you want to make. 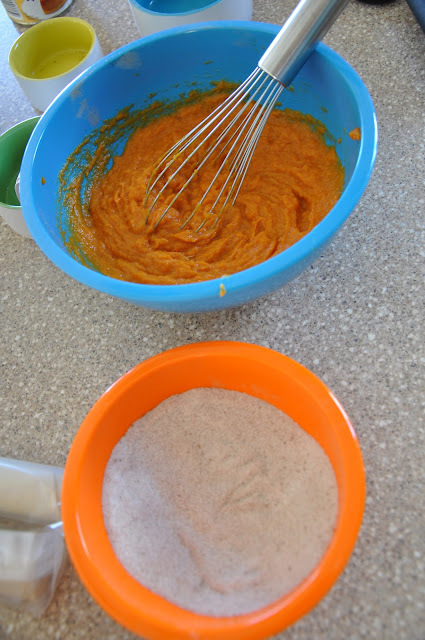 Combine sugar, pumpkin pie spice and salt together with a whisk. 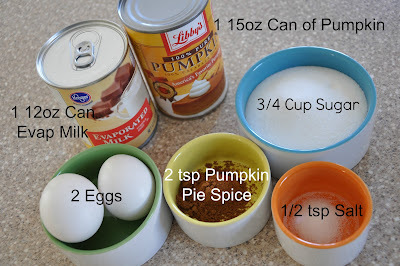 Beat eggs and then slowly combine pumpkin and add sugar mixture to that. Once that is all combined, stir in the evaporated milk. I used a 1/3cup measuring cup that wasn't quite full to fill the regular muffin cups. I used 1/4cup measuring cup that wasn't quite full to fill each mini muffin cup. Fill all your mini pie shells to just below level with muffin pan top. Bake at 350 for 35-40 minutes for the regular sized ones and 25-30 minutes for the mini ones. Check done-ness by putting a knife in the center, if it comes out mostly clean they are done. Enjoy with some fresh whipped cream and a sprinkle of pumpkin pie spice...by the forkful or by the bite! This batch made me 12 regular mini pies and 24 mini mini pies. :) I am guessing that if you make all regular size you would get about 24 and if you make all mini pies you would get about 48 bite sized ones. Spray pans. 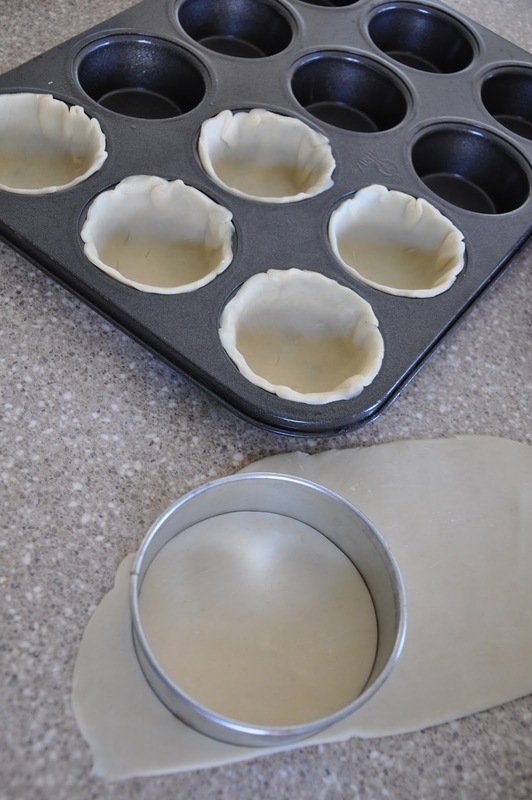 Decide what size you want to make and roll and cut crust and use to line muffin tins. Combine dry ingredients. Beat eggs and add pumpkin in. Add sugar mixture and then add in milk. Fill crusts to nearly full. Long time follower, 1st time commenter and I LOVE the verse you posted along with your comments! I've been having some issues on facebook lately from people commenting negatively about how I dress my daughter (in large hair bows)... they are so negative it wounds my spirit... love it. I may steal your idea! BUT... what I really wanted to comment about was how easy and delicious these look! I'm so excited to make these for my next BUNCO night! I also think what you do for your husband and his co-workers is so sweet! You're a wonderful example of a Proverbs 31 wife! If my husband worked in an office (he's a contract employee and at different places daily) I would absolutely do this! Love it! I really dislike pumpkin pie but my husband likes it. This looks like a great way to make it for him so I pinned it. I wonder if they will freeze well? Im going to try this, sounds yummy.I love pumpkin pie and to have my little special one is even better! I have done something like this before, though my pumpkin pies don't always turn out as well...maybe I will try your recipe. I have done many pie cupcakes before. If you get a flower (daisy like) cookie cutter that has a center circle the size of the bottom of the cupcake pan and the petals about the size of the height of the cupcake pan. It makes the lining with pie crust A LOT easier. 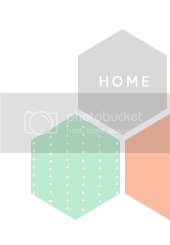 There is a lot less overlap. But not positive. I haven't made them since last Thanksgiving. These look great. My only concern is getting them out of the pan. How does that work? 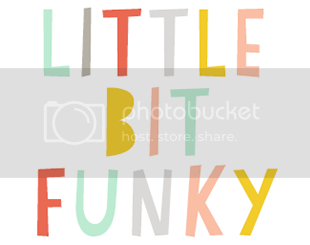 Bitsybet: I've made these twice and if you spray the pans they pop out super easy!! Btw I LOVE this recipe! Super tasty, super easy, and super cute! 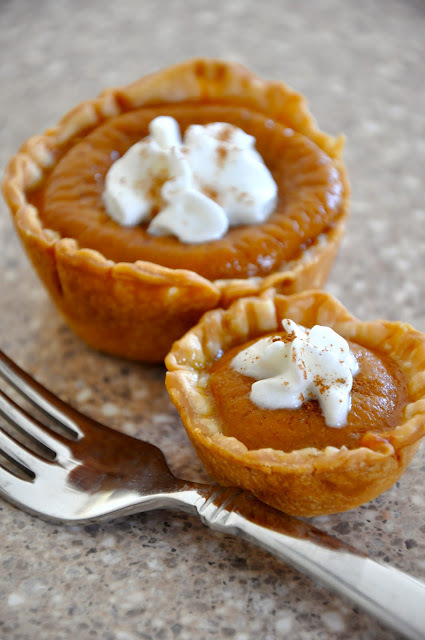 I am making these for Thanksgiving desert, and I know it is last minute, but I am wondering if I need to partially bake the crust or will it cook through even with the pie filling in there. Thanks! This looks like a great desert!